As music has evolved through generations, so have the devices for listening to music. Manufacturers have come up with sleek & stylish gadget designs with additional features to satisfy the rising public demands. This write-up compares two portable Bluetooth speakers that are built to impress the masses with 3 core features- enhanced sound quality, wire-free usage convenience and ease of carrying anywhere! Consumers can enjoy a family movie night, a party by the pool-side or a fun friend’s trip to the hills without worrying about poor audio anymore! The budget-friendly pricing definitely makes things more exciting! In this study, I will thoroughly assess two trending American Brand portable Bluetooth Speakers: Bose Revolve Plus and JBL Xtreme 2. As I dig deeper into comparing both the products, I’ll touch upon the key elements of each gadget such as their design, sound quality, features or ease of installation, along with their pros & cons. Now, let’s quickly move on to the review. A classy well-designed gadget surely pleases the eyes! Both the speakers have dissimilar designs and are stylish in their own way! I will begin with Bose revolve Plus. Its design is brilliant. It is smaller & displays a vertical design unlike the JBL Xtreme 2. It is 4.2 inches wide, 7.3 inches high and weighs 2 pounds making is a petite handy chic wireless speaker to carry along or place anywhere in the house. Its sturdy aluminum body feels soft to touch when using the buttons or carrying. As I carried the speaker with its flexible handle to the gym, it sure attracted attention. JBL Xtreme 2’s miniature drum-like design with two woofers on each side is more practical than appealing. Therefore, Bose wins when it comes to looks. JBL Xtreme 2’s mesh solid body is 11.3 inches wide, 5.2 inches high and weighs 5.14 pounds. It is bigger & heavier than Bose. Yet, carrying it becomes convenient as it comes with a detachable strap which can be hooked to the metal clips in the speaker. The Bose Revolve Plus speaker as promised delivers a fabulous 360-degree sound coverage! It is very loud and sounds great in a small/medium sized room as well as outdoors. As a portable device, I was wary about the sound quality suffering when placed on diverse surfaces. To my surprise, the bass remained profound, solid & effective while vibrating impressively on various surfaces indoors/outdoors. I tried checking its sound quality on low, medium and full volume ranges. I found out that Bose Revolve Plus speaker performs best in the medium volume range (50-60%). The sounds seemed natural, irrespective of whether it was a movie’s dialogue, a rap song lyrics or an orchestra band playing. When I set it on maximum volume, I noticed that treble & bass notes tend to become less distinct. So, I suggest keeping the volume two notches lower than the maximum. I feel due to the cylindrical shape of the speaker, the treble is not that great. Overall, its sound is incredible. The JBL Xtreme 2 is an upgraded version of the original with a bigger & better sound. The trending hip hop & pop music sounds fabulous in this mid-size portable Bluetooth speaker. As a mark of all JBL speakers, the deep bass and slight treble push is totally excellent as it adds a perfect edge to the sound. Although, I should tell you that the Xtreme 2 isn’t louder than the original. After playing at all volume ranges, I found that the Xtreme 2 speaker sounds best at a slightly higher range (60-75%). It is quite loud and the sound quality doesn’t drop or break at higher volumes. When I set the volume in the medium range (50-59%), the sound seemed unnatural. Overall, the speaker’s sound has a good balance in higher ranges but its sound varies when played indoors & outdoors. The first feature I would like to mention about Bose Revolve Plus speaker is its loud 360-degree surround sound coverage. The next is its wireless Bluetooth feature that ranges up to 30 feet. I personally found the Bluetooth hands-free pairing with voice commands so convenient. It supports Google, Siri & Alexa accessibility and I can even receive calls. Once I installed the Bose Connect app, connecting the speaker and alternating between Bluetooth devices became easy. I can carry it conveniently with its flexible fabric handle. It is water resistant and has a strong aluminum body. The rechargeable batteries allow 16 hours of non-stop usage. To begin with, JBL Xtreme 2 speaker has a great deep & loud sound. The wireless Bluetooth feature is ideal for outdoor usage. For portability convenience, it comes with a detachable strap. The strap can be clipped on the two metal clips in the speaker and can be taken off at will. It is water resistant (up to 3.3 feet deep) and has a durable mesh body. The rechargeable batteries take 3.5 hours to charge 100% allowing 15 hours of non-stop usage. PROS: Sound is full and well-balanced / multiple devices can be paired / battery lasts for 16 hours / durable aluminum body. PROS: Crisp & loud sound / Crystal clear & gigantic bass output / Useful strap for mobility / tough mesh body. CONS: Protects only from water splashes / Battery charging dock has to be bought separately / Smart assistance not available. CONS: Average looking drum-like design / doesn’t have 360-degree surround sound / No built-in assistance like Alexa etc. As I conclude the review, I would add that the Bose Revolve Plus even when kept in the room’s corner can beat the theatre sound system with its mighty bass notes & lucid vocals. The JBL Xtreme 2 though bigger and heavier than Bose, offers a balanced sound both indoors & outdoors. 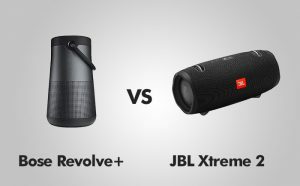 Those looking for more bass should definitely pick JBL Xtreme 2.